Danny Angus: Robert falls in! Didn't we already see this? Normal service will be resumed eventually. What Future for Apache Jakarta? Even more spoiled ballots - how stupid were we? 2, originally uploaded by ki113rb33s. Robert Burrell Donkin fell in this dock in Amsterdam last night, with his bag containing his laptop. Looking none the worse for his ordeal this morning his only concern is for his mac which went in with him. Apparently the Axio bag it was in helped to protect it on its journey to the bottom of the sea. Lets hope the all the incubator docs he'd written over the week can be saved. oops! My bad, I think this isn't the actual place anyway, but he still fell in ROTFLMAO! 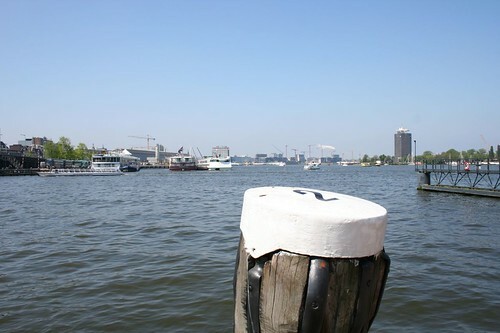 With that small pier on the right and Central Station in the distance on the left, this looks like the view from the Muziekgebouw Aan Het IJ/Bimhuis, which is right next to the Moevenpick hotel. Especially with the strong wind on friday (chairs were being blown accross the terrace), it sounds like a very likely place to get sufficiently drunk to fall into the water.